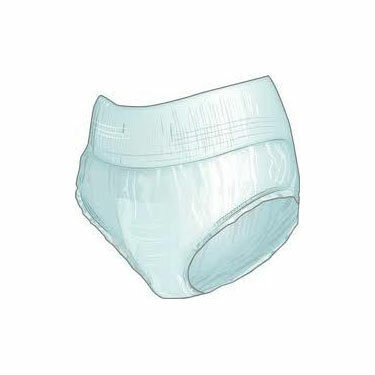 Provides the look and feel of real underwear for moderate to heavy incontinence. Offers maximum leakage protection and wearer comfort. Meets state performance requirements and is packaged in 50ct bags and 100ct cases for maximum efficiency. Offers trusted performance with a comfort enhanced fit. Packaged in discreet outer shipping carton. Medium fits waist/hip sizes 34" - 46"
Large fits waist/hip sizes 44" - 58"
Extra Large fits waist/hip sizes 58 - 68"
These are terrible. The padding wads up and overall, it's saggy. I'm sorry I bought them. Next time, I'll go with a different brand. Pros:I didn't like anything about it. Cons:Saggy, padding wads up. But they came quickly.